This is where Chinese tourists want to go in 2014! Top destination for Chinese tourists in 2014! Which countries are among the top 3 for Chinese tourists in 2014? All countries around the world have realized that Chinese people were the new category of tourists they have to attract at all costs, all the more so as everyone know that Chinese are big spenders. That is why capturing Chinese’s interest would be extremely interesting for any country. Thus, all countries are competing to attract Chinese tourists and meet their specific requirements and whims. The ultimate goal: becoming the top destination for Chinese tourists. But the question is: are Chinese tourists fully satisfied when they arrive at the destination they have chosen? Which countries succeed in meeting their needs and expectations? A new study from the China Tourism Academy has just released the new list of the most satisfying destinations for Chinese tourists in this year’s first quarter. Among 22 destinations studied, the winners are: New Zealand, the United States and Canada! So, the winner of this year is New Zealand! This is not surprising: it has already been demonstrated that New Zealand attracts +30% Chinese tourists per year! New Zealand Tourism is changing with the arrival of Chinese travelers. All the industry of the country profit to this new target, and helped boost overall shopping spending by 500 million dollars last year. China is the second market for New Zealand’s tourism! What happened to France? You have probably noticed that France, which used to be the top destination for Chinese tourists, moved to the 9th place. 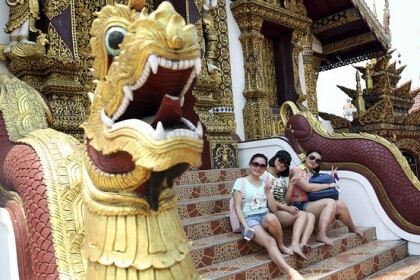 The country is gradually losing its leadership in terms of Chinese tourists’ favorite destination. At the bottom of the list, we can find Cambodia, Indonesia and Vietnam. According to China Tourism Academy estimates, the number of Chinese people traveling abroad reached 26.4 million in the first quarter of 2014, with a 17%-rise from the same period last year. As far as spending are concerned, total spending by Chinese tourists reached $3.4 billion, with a 16%-rise. Those figures are expected to increase considerably. According to CLSA estimates, the number of Chinese tourists overseas will reach 200 million per year by 2020, which means two times more than the 100 million who went abroad last year. Chinese are less and less interested in visiting their own country because of smog and crowds across China. That is why Chinese people tend to go abroad when they are on holiday. It is the same for inbound visitors: whether because of pollution or some other reason, the number of foreign tourists fell by 3%, down to 31 million. Puzzle Travel Agency (MICE & FIT) wants to attract Chinese tourists. When it comes to traveling, Puzzle Travel is your key partner in North Cyprus. For conferences or holidays, in North Cyprus, Puzzle Travel should be your choice of travel planner. We offer comprehensive services of organising meetings, journeys, accommodations and holidays to our customers. Our MICE department will take full responsibility of organising your congresses, meetings and general events. We offer flexible, customer-oriented services, catering for the individual needs of attendees from the very beginning to the end of an event. Our experience in the business is profound, we have organized more than a thousand conferences till date; it would be our pleasure to take the responsibility of arranging yours too! For a personalised holiday and charter flight experience in North Cyprus, our FIT department is more than happy to provide you with all you may need, including the offer of an opportunity to discover the spectacular beaches, historical places, unspoiled nature, quality hotels and bright casinos of Northern Cyprus. Among Puzzle Travel’s wide range of holiday products and services, you will definitely find one that suits your preference finely. Travel, Tourism, Holiday Package, MICE & FIT, Hospitality, Tour, Event Organisation . What about the travel in Africa? We see more and more Chinese tourists there? Injera is a professional Hospitality and Tourism company having head office at Bahir-Dar, Ethiopia(resort destination) in Ethiopia, office/agency network through Ethiopia, doing inbound tours, Managed by a group tour professionals having experience of more than 5 years on Hospitality and tourism industries in Ethiopia. We have four wheel vehicles, Luxury boats, and competitive rates with leading hotels or resorts throughout Ethiopia. We offer luxury (Economy tour packages and hotels, car rentals to all major tourist destinations in Ethiopia. We request you, if yourself/company/ family/ members/friends/ colleges/ supporters, well wishers are looking for a great holidaying/MICE/events/related inquires in Ethiopia, please feel free to contact us at any time, we are very much happy to assist and serve you. We are looking for a possible, co-operation with you for the coming days. Do you know about the country called Papua New Guinea? It is one of the last frontier on earth. A very unique and your travel in this paradise country is a lifetime experience. We provide inbound tour services for all travellers around the globe.